Nailed it at GlassLab on Friday! Working with glass, you learn to accept being in the moment. The material is subject to the weather, the gaffers (master glassblowers, all), and the design. Constantin and I were trying to develop a concept of a bouquet in a vase, made of glass, where real flowers could be dispursed among the fake ones--to stunning effect. Our first session was spent making canes (glass rods for the "stems") and developing a connection detail that would attach the "stems" to the glass vase. We developed this technical detail with the unparallelled Eric Meek and hoped we would gain traction from there. Before the second session, Constantin and I worked out the proportions and details--down to meaurements and connections. We had a new team to work with, and despite their best efforts, every single piece we made blew up after we got it off the punty (the stick you blow glass on). Luckily on Friday, Eric was back working with us and we made two beautiful pieces together. I'll post the images here on Monday. 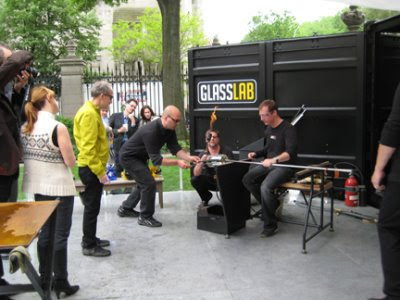 GlassLab Closes Today---Don't miss it! Like the yellow and white logotype? I did it!